We live in a world where communication dominates our day to day life. However, we will often hear slectively. The power of listening lies in taking an interest in what others actually have to say. It’s not uncommon for employees to complain about their boss from time to time. However, when your actions are creating a negative or stressful work environment, it’s time to listen up! According to an article: “8 Most Common Complaints Employees Have About Their Boss” – by Jeff Haden, contributing editor of Inc – bosses that don’t listen is one of the most common complaints employees make. During meetings, do you do more talking than listening? Do you tend to come up with most (if not all) of the ideas? Do you hear what people say, without reading between the lines, or looking for non-verbal clues? Do you have an attitude of “listen to me and do what I say”? When employees feel that their voices are not being heard, the problem is not just hearing them, but really listening to them. They want your attention and feedback, but more importantly, they want you to support their unique and individual needs. The best leaders truly listen to what is bothering their employees. They encourage transparency and genuinely try to help their employees to work through their performance slumps. In order to do this, you have to make time to listen. The power of listening is not just listening to the words that are being said, but also to your employee’s behavior, disposition, body language and facial expressions. As a leader, you must be cognizant of the needs and personality of your staff. Most employees want to know there is a good captain at the helm; a captain with a compasses that understands where they are at that moment, as well as how to navigate them forward. 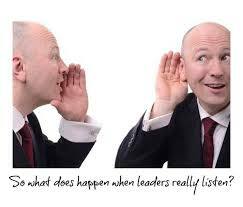 Real listening has a profound effect on performance. When you truly listen, you can appreciate the diverse personalities of your team members; you can become the bridge that helps your teammates communicate more effectively, and you can discover how to tailor conversations, so they are empathetic yet highly effective. Therein lies the power of listening!